Obstructive Sleep Apnea (OSA) is a sleep related breathing disorder which affects 2-5% of individuals over 30 years of age. It is more prevalent in males than females (the ratio is 2:1) although this difference disappears after menopause. Our muscles are more relaxed in sleep compared to wakefulness. Because of the partial loss of muscle tone, upper airways become somewhat narrowed although still open allowing unobstructed flow of the air to the lungs. Further narrowing of upper airways for any reason may lead to episodes of their incomplete or complete closure reducing or blocking the supply of air necessary to maintain breathing. Among the first symptoms of narrowed upper airways in sleep is snoring. Snoring is an audible vibration produced by structures vibrating in the airways, in particular the soft palate and uvula against the back of the throat. This is much more common than sleep apnea. Obstructive sleep apnea, on the other hand, is a term used to describe events of temporary cessation of breathing of at least 10 seconds duration caused by the complete closure of the upper airway. Five interruptions of breathing per hour of sleep is considered clinically significant but the number of events may be greater than 100/hour. A number of conditions can contribute to development of OSA such as increased body weight, a long soft palate, enlarged tongue, tonsils or adenoids, deviated nasal septum or malposition of the jaw. It is more common in people with a large neck. OSA can be a serious medical problem that puts severe strain on the cardiovascular system. If left untreated, obstructive sleep apnea can increase the risk of heart disease and stroke. Some estimates suggest that unfortunately more than 75% of OSA patients remain undiagnosed. People who suffer from OSA may be unaware that they stop breathing while asleep. Some have breathing stops which last a minute or more at a time and with a frequency that leaves the bed partners fear for their lives. Fortunately, for those who do not sleep alone, a partner witnessing interrupted breathing provides powerful evidence of a problem and good reason to seek professional help. 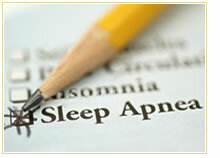 Sleep apnea can cause symptoms the sufferer may be able to recognize, although the connections may not be obvious. Since pauses in breathing cause temporary oxygen deprivation and accumulation of CO2 in the bloodstream, breathing often restarts with a deep and awakening gasp and a feeling as though one re-surfaced after having been under water for a while. Waking up gasping is therefore one important clue. Probably, the most common symptom of OSA is excessive daytime sleepiness which may be so severe that one unintentionally nods off to sleep, especially when he/she is inactive. Furthermore, having one’s brain on an all-night oxygen roller-coaster can cause morning headaches, which usually dissipate within a few hours. Difficulties in concentrating and memorizing, mood changes (irritability and/or feeling depressed), a frequent need to urinate during the night, erectile dysfunction and increased blood pressure are other symptoms associated with this condition. An overnight sleep study performed by a sleep professional is a gold standard to determine whether someone suffers from OSA. If you suspect that you or your partner has OSA a referral for a sleep study can be obtained from a family physician or specialist (a referral form is available on our website). An overnight sleep study involves sleeping in a clinic equipped to monitor brain activity, breathing, heart rate and oxygen level in the blood. There are a variety of effective treatment options for OSA which sleep specialist will discuss with a patient upon completion of the sleep study. They include one or combination of the following: the use of devices such as Continuous Positive Airway Pressure (CPAP) or oral appliance, lifestyle changes (weight loss, cessation of smoking etc. ), surgeries (tonsillectomy, soft palate or tongue reduction, correction of deviated nasal septum) or the use of medications to improve daytime alertness. The kind of treatment a sleep specialist will recommend greatly depends on the cause and severity of OSA.